For those that have been following my endurance adventures for a while now will know (without me sounding arrogant) that I don’t usually have bad races. I don’t race a lot but I am careful with my training, nutrition and the way I look after myself generally and subsequently I have a pretty decent record of getting the best out of myself. The Grand Slam started in style, smashing my 100-mile personal best at the Thames Path six weeks ago but then I forgot to listen to own advice of not racing too much and signed up for the Howgills marathon in the Cumbria/Yorkshire border just two weeks later, with the intention of just plodding around and enjoying the views. To be honest that was exactly what happened but the course had some technical parts where I picked up a niggle where the top of my left calf connects to the knee. I got massages, eased up on the running, did lots of cycling and swimming and it went away but it kept playing on my mind as the SDW100 approached. At the B&B we were staying in before the race, my co-ultrarunner Mark Haynes and I discussed race prediction times, strategy, the South Downs Way course, etc. Getting to the start was not a problem, the weather forecast looked ideal and soon we were on our way without any stress. The first few miles ticked without a hitch, nice comfortable pace, no signs of any niggles, quick and smooth through the aid stations and certainly enjoying the beautiful views of the South Downs. 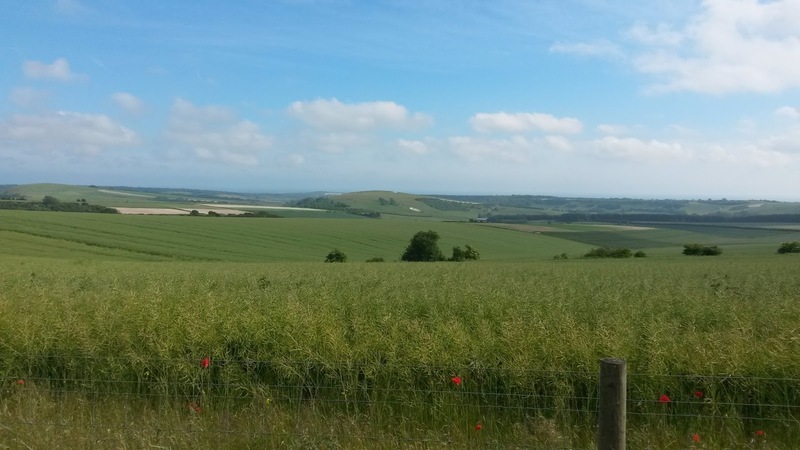 One of many amazing views of the South Downs. 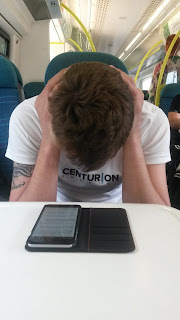 By mile 25 I felt a slight discomfort with my calf and panic quickly took over me, I tried walking for a minute or two then running again but as the miles went by it got progressively worse. By mile 30 I was running with a limp and the prospect of DNF-ing seemed very real. I ran and walked to mile 35 and in that period I was still indecisive about what to do: ‘quit at the next aid station?’, ‘ask someone for a massage?’, ‘take some Ibuprofen?’…’Am I letting everyone down who has already sponsored my charity’, ‘what will it do to my confidence if I quit without a fight?’. It was not a good place to be in mentally. From mile 35 onwards I made my mind up to continue walking to mile 50, then I would ring my wife in case she was worried seeing from the tracker that I was slowing down. Once I made it to 50 miles in over 10 hours I quickly worked out that if I walked 3 miles per hour I would have 2 hours spare to finish the race within the 30-hour limit. Was I prepared to push my ego aside and carry on? Hell yeah! I wanted to prove to myself that I was mentally strong, the prospect seemed daunting at the time but I want that Grand Slam buckle badly and besides, I don’t want to be the sort of athlete that gives up when the going gets tough. I phoned my wife, updated my Facebook and Twitter in case someone cared. I felt a great relief, the pressure of doing well was no longer there and just finishing was my goal now. Walking wasn’t painful at all then, every now and then I tried running but that didn’t last for more than 5 seconds, I couldn’t understand what the problem was, to lift the knee just that little bit higher to run stretched the muscle fibres further which caused great discomfort. Just as I was walking downhill into mile 54 (Washington Aid Station) my buddy Mark Haynes caught up and seemed surprised to see me, I explained the problem as we entered the village hall. While he stopped for some hot food I quickly left the aid station and continued with my walking. Maybe 3 miles later Mark caught up with me again and we walked together for a bit. I didn’t want to say anything but I thought Mark felt a bit sorry for me and just wanted to offer me some company. As the time went by I realised Mark could not long run either with a problem with his foot. We were both on the same boat, lots of hours ahead, with the dream of keeping the Grand Slam alive and both determined to push through. It was SO great to have a familiar face with me, time went by quicker, we talked when we felt like it, we kept each other motivated when one another felt low, we celebrated as we made it to each aid station, we took turns opening the endless gates, we had funny moments (like when I jumped two feet in the air mistaking a stick as a snake in the middle of the night), and we just kept putting one foot in front of the other despite the hardship. It got quite cold at night, and the kit Centurion Running demands you carry for their races was vital. I probably wouldn’t have used the spare baselayer if had I been running but it was fundamental as a walker. I usually have my phone off when racing (to save the battery for emergencies) but every few hours I turned it on for a few minutes to let my wife know I was safe. Checking messages from friends who were up till late at night telling us to keep moving was a great motivator, special thanks goes to @Leeny_Lou, loved your tweets, got me smiling every time I read them. Mark and I got through the night in one piece, it was around mile 87 or so that it got lighter again, we knew we had plenty of time to finish but those who have been to the eastern part of the South Downs will know how much chalk there is and how hard the underfoot conditions are. Mark had been struggling with his foot and I could feel blisters on both mine, every step was painful, like a long lasting toothache, we searched the ground for the best places to walk and any sight of grass was a welcomed respite. 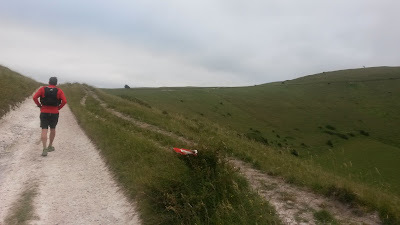 We both knew the last few miles of the course and were counting down the big hills, the penultimate was just after Alfriston, round mile 91, you go through a very sharp steep hill through some trees, then once you clear this the ground hardens with lots of chalky rocks and it goes up for what seems like an eternity (see pic), it feels a bit demoralising when you see it but you’re rewarded with amazing views of Alfriston behind you. A little over 91 miles - Relentless forward progress! We made it to the last aid station in Jevington with just over four miles to go, we quickly left the aid station, by then our walking wasn’t so great but we knew we would make it and nothing else mattered, we could taste the finish line (and the bacon butties). We climbed the last big hill towards Eastbourne and we could see the floodlights lighting up in the athletics track at the race finish. What a relief it was to finally enter the town and leave the trails behind, I won’t need to walk on any chalk for a while! We tried walking a bit faster to make it in under 26 hours but it was a bit far and we had nothing left in the tank. I was so delighted to cross that finish line in 26h05min and keep the Grand Slam dream going. Like Bear Grylls says: ‘Run if you can, walk if you have to and crawl if absolutely necessary but NEVER ever give up’, glad I didn’t have to crawl though! Obviously it’s great when things go your way but what a great opportunity I had to experience something different, personal bests are very cool not doubt but having to really work hard to make it to the finish was a very humbling moment for both of us. Thanks Mark Haynes for the great company, without a doubt you made my journey a lot easier, thanks everyone who sent me messages of encouragement through the day and night, thanks everyone that donated to Eaves (https://www.justgiving.com/braziliangunner/), I really didn’t want to let you and Eaves down, thanks to my beautiful Anna and my daughters to putting up with all my training, thanks to Graham and Harvey who rec’ced the South Downs course with me last year and thanks to Centurion Running for another immaculate event and of course super thanks to the hundreds of volunteers who make this sort of events possible. 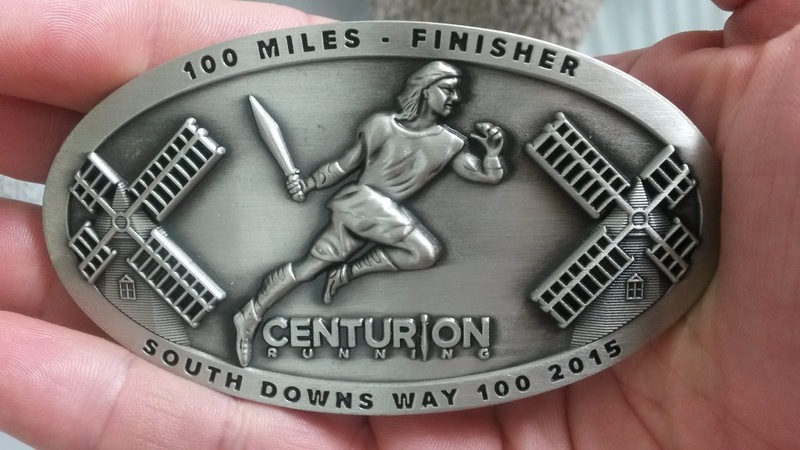 It may have been my personal worst for 100-miles but one I will treasure for a long time. Plenty of rest and recovery for me until the North Down 100 early in August. I can’t wait! I will wear that with pride. Someone was a little tired after being up for over 30 hours! DNF is an abbreviation for Did Not Finish. What a memorable weekend. Love that buckle.